Teachers and students of the Brickdam Secondary School no longer face imminent relocation or reassignment to other schools but will occupy the current building for the remainder of the school term. This disclosure was made by Chief Education Officer Olato Sam yesterday afternoon during an emergency press briefing in the Ministry of Education’s boardroom. 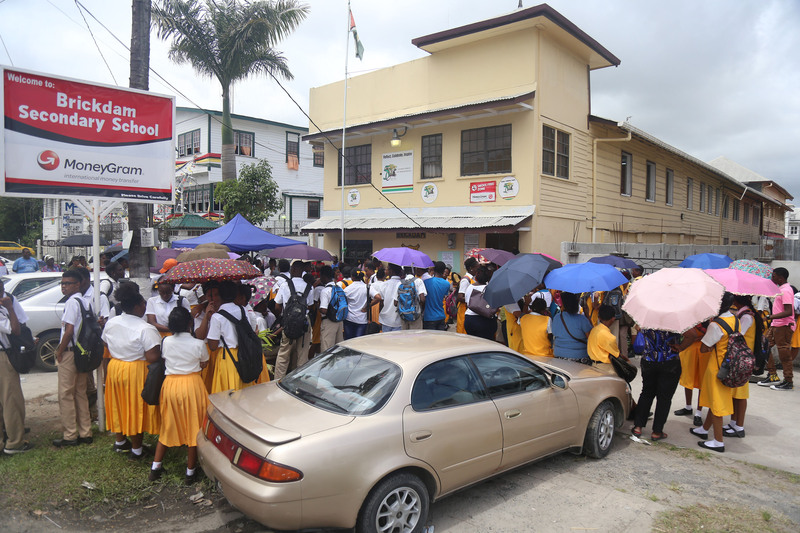 On Tuesday, Sam had announced the ministry’s decision to temporarily reassign and relocate teachers and students of the Brickdam Secondary to schools around the city in the light of concerns raised by teachers over the condition of the building. During the press conference, Sam stated that following Tuesday’s announcement, further consultations were undertaken with the Board of Governors, the executive of the Parent Teachers Association and teachers of the school, which resulted in them arriving at a position deemed to be in the best interest of all parties involved. “As a result of discussions this morning [yesterday] with entities previously mentioned, it was revealed that teachers, parents and the Board of Governors of Brickdam Secondary wish that the students remain at the school to complete this term, giving the ministry time to identify a new location to accommodate the school for the new academic year. The teachers have all formally agreed to this and have affixed their signatures to this document as an indication of same,” Sam said. He went on to say that the process was witnessed by the Chairman of the Board of Governors and the school’s PTA President. 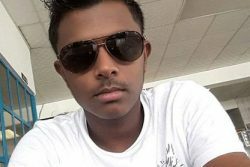 “As it is, we are prepared to have school recommence at the Brickdam Secondary from as early as tomorrow [today] and complete the term at that location, while the ministry actively engages in the process of identifying a more mid-term solution for the commencement of the new academic year,” Sam said. Asked about the safety concerns, Sam said it was not his place to make such pronouncements nor will he venture to do so. “I must say, however, that the ministry is convinced that the measures we have put in place thus far and the things we have agreed upon is in the interest of the safety of the students and teachers. We would not ever like teachers or students to be in any environment that can be of any danger to them and so we will be monitoring the situation to ensure they complete the work that is necessary. We are convinced that the numbers are small enough to be managed and as such with a table that is going to be devised for this to happen we are going to minimize any potential for any events,” he added. Additionally, Sam explained that while the acquisition of land is in progress, he could not say exactly when the construction of the new building to house the students would commence as the process would be a very timely one to undertake. “As you are aware, there is a process. We have to go to tender. We have to decide on a design. There are certain prerequisites that have to be completed. We will ensure that this is done as quickly as possible as we would have indicated time and again, this is an area of priority and has been on our agenda for some time and there is evidence to support this. We wouldn’t want to expand this process a day longer than it needs to be so we will move as hastily as possible to have it completed,” he said. Meanwhile, when Stabroek News visited the school yesterday morning, parents and students had converged in front of the building voicing their dissatisfaction with the announcement made by the Ministry on Tuesday. “Our children have to relocate to North Georgetown Multilateral, North Georgetown, Christ Church and Central High. Now when these children go there they have to adjust to the new environment. My son has Grade Nine assessment starting Tuesday, this is no proper thing they telling us, we need a new building,” one parent said. “I attended Brickdam 21 years ago and it is the same building; it is the same situation all these years after. Some parents refused to collect the school relocation letters being issued by the ministry. Another parent said, “We need a new building or we need a building. There are a lot of buildings that they can put us in but instead they are throwing us here there and everywhere. We don’t want to split up we need Brickdam. Last Friday, teachers had staged a sit-out in protest at the poor conditions at the school, which they said had not been addressed although numerous complaints were lodged with the ministry. 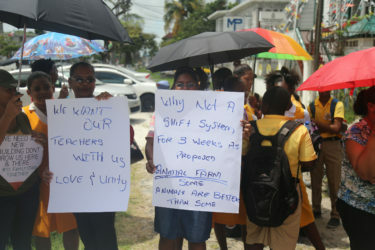 Stabroek News understands that a ‘sit-in’ continued on Monday as teachers pleaded to have the situation rectified. The next day, the ministry made a decision to relocate the teachers and students to different schools around Georgetown. However, this decision was not well received by teachers or parents of students during a meeting Tuesday afternoon at St Stanislaus College. Sam had then attempted to justify the ministry’s decision to close the school, explaining that after the teachers’ first ‘sit-in’ action last Friday, a meeting was held and several proposals were made. One of the suggestions required the teachers to continue teaching the students until the end of the school term while works are carried out on sections of the building. Some of the works, he said were done over the weekend. At the end of the school term, Sam said, steps would have been taken to find a more permanent solution. 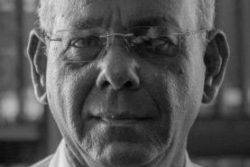 He said this was agreed to by those who attended the meeting, including teachers, representatives of the Guyana Teachers’ Union and representatives of the Ministry of Education. Sam said he was taken by surprise on Monday when he was informed that the teachers had staged another sit-in and it was that action by the teachers that forced the Ministry of Education to move to close the building and transfer the students and teachers. This did not sit well with the audience of parents who loudly objected, but Sam had stated that the decision was final.